Easy Rack carries a wide variety of pallet trucks including gas and electric pallet truck and pallet jacks with scales. Our line of pallet trucks offer a safe and economical way for employees to efficiently move heavy pallet skids without the use of a fork lift. Listed below are the many different pallet truck types that we offer. Powerful gas powered pallet truck with traction drive system makes it easy to move bulky material over rugged, uneven terrain. Pallet truck will handle loads of 2000 lbs. or 4000 lbs. capacity @ 18" load center, pallet truck also includes power fork lift and lower, durable steel construction means years of dependable use with blue painted finish. Large containers are often crated in such a fashion that standard pallet jacks cannot lift them. Large containers of unique dimensions likewise are difficult to manipulate with even the sturdiest of pallet jacks. Heavy duty all terrain pallet truck is lightweight yet its strong tubular frame design handles evenly distributed loads up to 2,000 lbs. 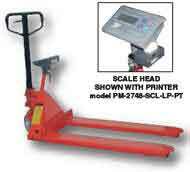 A pallet jack with built in scales allows you to weigh your material on location to maximize employee efficiency. Pallet truck frame has a heavy duty steel construction for strength and durability. Low Profile Hand Pallet Jack ? Pallet Truck. Our low profile pallet truck allows employees to access pallets from all four sides. Pallet truck is made with a reinforced steel frame that will handle a 4,000 lb load. Big Wheel Pallet Truck - Pallet Jacks. Big front wheel heavy duty pallet truck is a new piece of material handling equipment that facilitates moving products or bulky material over uneven floors. Load capacity is 4,500 lbs. Transport long bulky loads down narrow aisles with this heavy-duty pallet truck. This versatile and durable pallet truck retains all the quality workmanship of a standard hand pallet truck in addition to providing lateral movement. Chrome, Galvanized, Zinc and Plated Pallet Jacks. Engineered for corrosive material handling or wet environments these full featured pallet jacks were designed for laboratories, chemical, pharmaceutical and wash down. Features include skid adaptors, low temp hydraulic oil, adjustable push rods and 180? turning radius. When you are planning any business or industrial process, one of the main considerations to bear in mind is the way in which materials are to be moved around. Inevitably, there are a number of calculations that must be made in this process, but the normal method of ensuring the best internal distribution is to use people. Stainless Steel Pallet Jacks with Stainless Steel Frame & Forks. Designed for sanitary, pharmaceutical, medical, food and damp environments. Stainless Steel Pallet Jacks offer long life in harsh environments. Power Assisted Ergonomic Pallet Jacks - Pallet Trucks. Nose Wheel Pallet Truck - Pallet Jack. This type of pallet jack is designed to position pallets or skids closely in a row. The fork end is set back from the front rollers allowing for one pallet pick up at a time. The unit has a rubber grip handle with a three lever position for easy operation and maneuvering. This heavy duty unit is rated at 5,000 pounds capacity and has a service range from 3-1/2" to 8". Unit includes two articulating steering wheels and two front load rollers. Spring loaded loop handle automatically returns to vertical position when not in use. Extra long 45" forks are used with standard 48" long pallets. Short 38" forks are used for maneuvering in tight spaces. Economical Hand Pallet Truck - Pallet Jack. Our quality built hand pallet truck is economical and safe way for employees to move loaded pallet skids without a fork lift. Freight Pallet Jack with Analog Scale. Easy Rack offers a unique pallet truck that combines a pallet jack and commercial scales into one unit that economically, safely and efficiently weighs your pallets or skids. Our electric powered mobile pallet truck is design to be easy to use, safe and helps warehouse personnel be more efficient. Convert your mobile pallet truck that will economically standard pallet truck into a portable workstation in minutes. Our pallet truck caddy is designed with user efficiency and handiness in mind. Our pallet truck skid adaptor increases raised height by three inches and adapts to most pallet trucks. Fork Lift <?xml:namespace prefix = st1 />Battery Mover Adaptor. Our battery transfer fork lift adaptor is designed to load, unload and transfer fork lift batteries safely and efficiently. Stand Alone Battery Transfer Cart. Battery transfer cart is a stand-alone material handling unit that does not require a fork lift. Designed to easily move, load, unload or transfer fork lift truck batteries. Easy Rack carries a wide variety of commercial shelving, material handling equipment, commercial lighting, used pallet racks, and modular prefab buildings installed nationwide. If you can not find what you are looking for call us toll free at 1-888-776-3720 and we will find it for you. Our home office is located in <?xml:namespace prefix = ns0 ns = "urn:schemas-microsoft-com:office:smarttags" /><?xml:namespace prefix = st1 ns = "urn:schemas-microsoft-com:office:smarttags" />Houston, Texas with regional distribution centers located in all 50 States including New York NY, Los Angeles CA, Miami, FL. Chicago, IL. Denver CO., Dallas TX, San Antonio, TX, Austin, TX, Boise ID, Atlanta GA, Albuquerque NM, Raleigh-Durham NC, Washington DC, Albuquerque NM, Huntsville AL, Fayetteville AR, Norfolk VA , Madison WI, Jersey City, NJ Newark, New Jersey. Hand pallet trucks by Easy Rack offer just such an advantage without compromising ease of use or personal safety. Lallet jacks provide ergonomic and safe material handling solutions to a variety of indoor and outdoor environments. Easy Rack pallet truck feature specialize wheel mounts and designs that allow them to roll smoothly over a variety of rough outdoor terrains and uneven floor surfaces. There are literally dozens of hand trucks and carts available that are perfect for a role within the workplace, and choosing the right one for your needs is often simpler than you would think. Electric Pallet Stackers & Skid Lift Servers. Large containers are often crated in such a fashion that standard pallet jacks cannot lift them. The key design feature of a pallet inverter and its actual purpose is to be able to lift a palletized load, and allow it to be flipped over vertically so that the topmost items are placed at the bottom. Sidewinder pallet truck allows long loads to be moved down narrow aisles with this durable Sidewinder pallet truck. This highly adaptable pallet truck retains all the qualities of a standard pallet truck in addition to providing lateral movement. Battery transfer cart is a stand-alone material handling equipment unit that does not require a fork lift. Designed to easily move, load, unload or transfer fork lift truck batteries. This economical palle truck caddy will convert a standard pallet truck into a portable workstation in minutes. It has been designed with user efficiency and convenience in mind. Electric powered pallet truck & pallet Jacks is design to be easy to use, safe and helps warehouse personnel be more efficient. Ergonomic econnomical standard hand pallet truck is an efficient and economical way for one employee to move heavy pallet loads without the use of a fork truck. This type of pallet jack is designed to position pallets or skids closely in a row. The fork end is set back from the front rollers allowing for one pallet pick up at a time. Anyone who has operated a fully loaded pallet truck knows the most ergonomic unsafe part is getting the wheels moving. This Pallet Truck solves this back breaking problem. Stainless steel pallet truck with Stainless Steel Frame and Forks are suited for sanitary, pharmaceutical, medical, laboratory, food, clean room, corrosive material handling, and wet environments. Unique full featured pallet jacks are chrome, galvanized, zinc and Plated pallet trucks. Big Wheel Pallet Jack has found its home in the heavy duty material handling equipment industry. Large pallet truck front wheels makes for easy movement of bulky material over uneven floors and rugged tarrain. Low Profile pallet trucks are ideal for skids and low profile pallets. 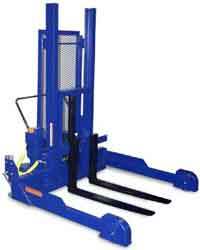 Features 11/2" lowered fork height for extra low profile skids, pallets or material handling equipment. 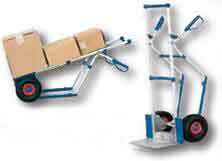 Pallet Truck with built in Scale that allows you to safely and efficiently weigh your material at point of access. Pallet truck offers a steel frame design and built for strength and durability. All Terrain Pallet Trucks can be of use at construction sites, gravel pits or nurseries. Features large 17" front pneumatic tires and 10" pneumatic steering wheels. Gasoline Powered Pallet Truck! Easy Rack carries a wide variety of pallet trucks including gas and electric pallet truck and hand pallet jacks with scales.